You must be a member of the Rio de Janeiro Culture Group to attend this activity. Would you like to join this group? Hi guys, sorry for the short notice but I think it will be fun! GIN & TONIC FESTIVAL, what is happening??? 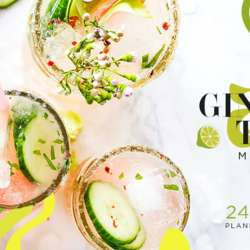 THERE WILL INVITE SOME BARTENDERS PREPARING DIFFERENT KIND OF DRINKS WITH GIN AND ALSO LIVE MUSIC PLAYING: Dave Mathews Band, Marisa Monte e Beatles. ON THE "TROPICAL GIN STAGE" SOME OF THE BEST DJS OF RIO LIKE Nepal, Mary Lou, Felipe Guga, among others. So I think it will be a nice opportunity to cheer up and make new friends! See you this Friday at 7:30 pm on the main entrance of Protected content Danielle.